I want my kids to love being outside, because it is just so good for them. My current goal is to have our kids outside one hour a day. It sounds easy enough, and it is nowhere near the 3+ hours they actually need according to many experts. Studies show it helps their brain development, their emotional regulation, and even their general happiness as a person. Time outside is also the perfect anecdote to our overfilled Capitalism-driven life, enjoying what we already have instead of constantly wanting more. Beyond all the good loving the outdoors can do for your kid, it is also one of the best things you can do for the world they grow up in. We can't save what we don't love, and our environment is in desperate need of saving. 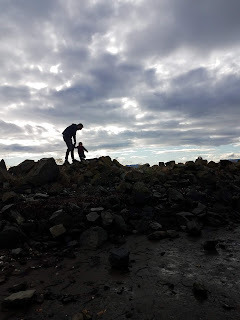 No matter what age your child is, the best way to empower them to understand climate change and help is to strengthen their connection to nature. Now, we can't make our kids fall in love with nature any more than we can make them fall in love with asparagus or the symphony. In reality, we just don't have that much control; they are their own people. But we can help frame what is normal, share what we love with them, and put lots of chances to connect in front of them, but our power over the situation ends there. I think the most powerful tool we have as parents is that we define what normal is- what is a "normal" meal or "normal" bedtime routine. It doesn't really have to be the norm at all, but it feels like the "normal" to your kid, because that is what they are used to. You can't force your child to love anything, but you can build a space and routine where being out in nature feels normal and comfortable, and that is a great way to start. This list has activities in it, but it also has lots of ideas on how to put a nature-engaged "normal" into action. I think the best advice I can give is to pick the ideas that already intersect with the things that already make you or your kid happy. They love to draw? Make art outside. They tend to be observant? Start a nature notebook. 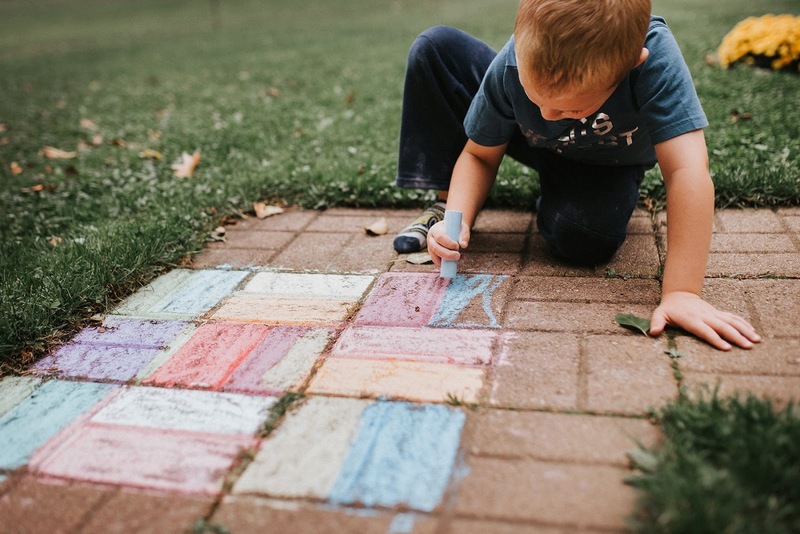 You are an expert on that kid; use that knowledge to connect them with outdoor spaces. The first and most important step in having your kid love being outdoors is doing it yourself. You don't have to be granola or covered in REI goods, just think about why you love being outdoors, what you most like to do outdoors, and model it for your kids. If you want your kids to be excited about going outdoors, you have to model that love yourself. Focus on the spaces and activities you like, and you can plan this as time you will really enjoy. Parenting advice loves to talk about self-care, but it can be really hard to figure out what that actually means for you- not everyone wants candlelit baths, for goodness sake. For me, weeding and taking care of our garden ends up being a calming and cathartic experience. It's surprising, but it feels like self-care. Also, if I am just over everything, I pack them into the stroller (where they are buckled in) and just go for a walk. It's the best. Looking at and talking about nature are skill sets, so we have to practice to get good at them. I highly recommend How to Raise a Wild Child for really thoughtful tips on how to engage your child in nature. I am not great at this, but when I notice things on our walks, I always try to point them out now. Even those little things can make a difference. This is true for basically all parenting, right? And it's hard. But something about being outside can give us the freedom to ask "what's your plan?" instead of just demanding they be careful. In other words, it actually gives us the parent a little bit of freedom. It can be hard to keep at a parenting choice if we are doing it alone. 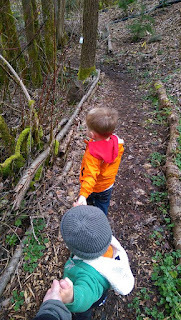 Join a group like Hike it Baby or Free Forest School. It's a great opportunity for your kids to learn and for you to make some parent friends. Even if that community is online. As some responsible person out there knows, preparation is everything. A lot of the common outdoorsy complaints (temperature and hunger) can easily be avoided if we bring a few things with us. A little bit of preparation can turn any adventure into a success. We can get into a rut thinking you only go outside in the summer. False! Every season has something interesting to offer, from buds on trees to falling leaves. Any time outside can be good with weather-appropriate plans (or some warm clothes and a willingness to launder). I tend to just wing it and hope for the best, but clothes (HATS for all seasons) turn out to make a big difference. f it is cold, wear lots of layers and boots (I recommend Kamik). If it is rainy, you need a good pair of rain boots and a raincoat (or muddy buddy, where they look like a bright marshmellow). Save money and get it used. I know I am preaching to the choir here (because all parents know that life is better with snacks) but a refillable water bottle (we like Liberty Bottleworks and Klean Kanteen) snack storage (UKonserve and Replay) and reusable sandwich bags (Full Circle and marley's monsters) keeps everyone happy (and the Earth- no disposables). This stuff gets used everyday at our house, because my kids first true love is eating. Ok, this is a tough one, but we both know we need it. Sometimes cutting out classes or birthday parties or activities makes the space we need to slow things down. If you are saying to yourself that you are too busy to spend more time outside, it may be time to cut other things out. Want your kid to engage with nature more? Let them be bored for a minute. Most American children (mine included) have way more toys than they need. If you have too much stuff, give some away. Put some away. Just don't bring them outside. If you feel at a loss about what to do outside or how to do this, check out some of the great resources out there. A few blogs on this exact topic that I like are Stir the Wonder, The Word of the Wild, and The Ladybird's Adventures. 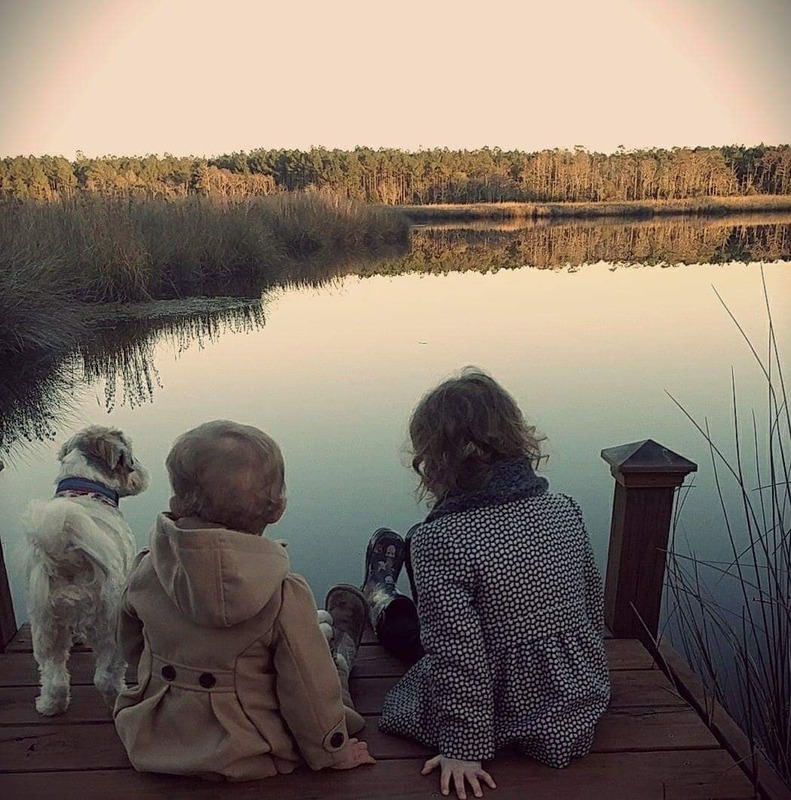 No matter how little your kiddo is, they will still benefit from time outside. Even the tiniest bubs benefit from getting wrapped up and taken for a daily walk. No matter the age, start now. If you make it a thing you will do when the conditions are perfect, that day won't come. Today is a perfect day. 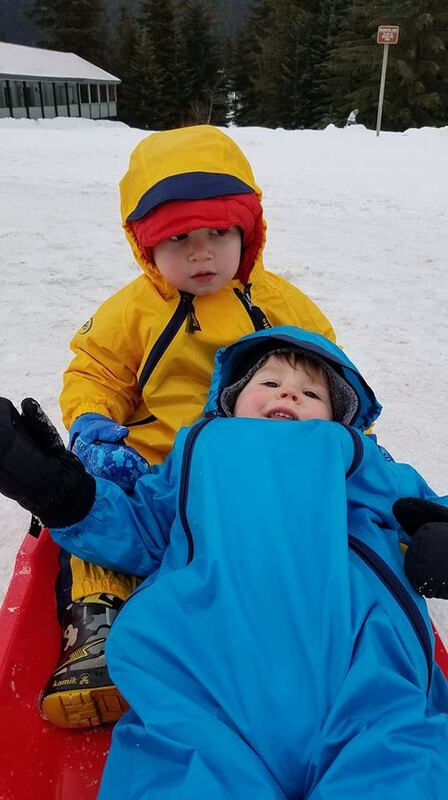 As parents, we sometimes push back on stomping in puddles or getting into the snow because that's the only clothes we have! We keep an emergency bag of sweats in our cars for both kids, and I keep a wet bag (this one from Planetwise) in my diaper bag. I can let adventure happens and keep the carseats dry. You can't make them love nature, but you can make it feel so normal that they feel weird without it (like not brushing your teeth or waking up on the wrong side of the bed). We often feel so short on time already, but if you make time outside a regular part of routine, it benefits everyone. Give it a time, everyday if you can. This might be at 4, when people are home from school. It may be first thing in the morning, when everyone is in their best mood. Choose one morning a week where you ALWAYS go to a park. Make it a thing they (and you) can count on. Are you getting your 10,00 steps a day? If not, it’s time to load the kid up in a stroller and walk to the grocery store. Which playgrounds or restaurants are walking distance? Make those your regular spots and walk there. Have kids that don't always open up? Consider making an after dinner walk part of your routine (even once a week), leave the phones at home, and just get in the habit of moving and talking together. Share your happiest and hardest parts of the day. It could keep the channels between you open when they are teens. Go to a park every Sunday for lunch and the afternoon. Make a weekly hike the norm. When you are doing your weekend relaxing, do some of it outside. Go outside and do yardwork together every Saturday morning. Such a simple one, but if you are a parent (especially a work at home one), you probably plan playdates. Just ask if you can meet up at a park instead of a coffee shop or playspace. A simple visit to a playground or backyard makes for a fun morning and more time outside. Combine that social-emotional learning and outdoor spaces, and you are multi-tasking! Woot! I know I am guilty of just sitting in a car with my kid/s, waiting out a 15 minute gap in our schedule, because it feels like a pain to unload them (and honestly, I can sit on my phone. Not cute, but it is the truth). Just popping out and exploring where we are could be great. If you have a child who notices the little things or likes putting things into words, you could start a Nature Journal. You can just use any old notebook, but if you like something with a little structure (and advice) I do like this one. If you are a routine kind of family, just adding an entry to your day or week might be a fun and interesting project to take on. Most of us use some screen time as parents- sometimes you need to make a phone call! One of my girlfriends geniusly puts on nature documentaries when her kids need to veg out for a minute. They learn a bunch of new things, and the pace is generally pretty slow. Not your kids? Maybe nature-oriented programming like Dinosaur Train or Tumbleleaf? You can feel a little less guilty while you take your break. We love those spring and summer birthdays, because you can party outside! Outside parties don't need much decoration or fuss, they are more photogenic, AND being outside naturally makes people happy. I love the association of happiness and celebration with the natural world. Throw your baby shower, anniversary party, housewarming party, dance party, or really any shindig you can outside. My 4-year-old is solidly obsessed with picnics. We can get away with almost any food if we call it a picnic and sit on a blanket. It feels like a kind of cheesy and old-fashioned thing to do, but eating outside (even in your own neighborhood) can mark a meal as special. We all travel. We travel to see family, to visit new places, and to try new things. Make nature a part of all your travel plans. Every new place has new nature worth seeing. When planning trips, be sure to check what parks and natural beauty are near by. Even on family trips, it can be a great setting for family time and memories. You don't have to do something elaborate and expensive to have amazing trips with your kids. Go camping or rent out a cabin instead! You get that focused family time and adventure for significantly less money than any other kind of vacation. If you aren't ready to brave bathroom-free spaces, just camp in your backyard! Think about it- most holidays (in most religious traditions) have outdoor elements. You go caroling at Christmas. You do an egg hunt at Easter. The list goes on and on. If your holiday celebrations don't include a fun outdoor activity already, switch things up and find an outdoor tradition that everyone loves! Have you seen every playground in your town? How about every State Forest in your state? How about every National Park? Have you learned to ski? Have you biked 10 miles? Could you eat every meal all summer outside? Can you walk the whole way to Grandma's house? Set some big goals together as a family and achieve them! It doesn't really matter what it is. 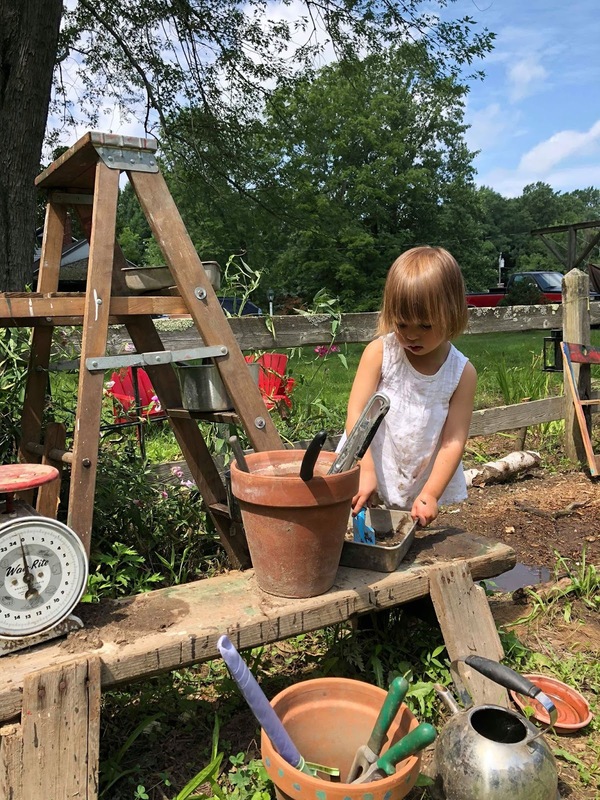 Growing things with your children can add new positive elements to your routine with each other- patience, nurturing, and maybe even vegetables! Growing in a garden together helps your kids make connections about where their food really comes from, but it also is a perfect excuse to get outside every day. Maybe you have the outdoor space for a garden, maybe you really don't. If you do have the space and have never started one, here's your goal for this spring. If you don't, even a little potted garden of herbs on a windowsill can have the same effect. You don't have to have a green thumb, and maybe it will totally fail (but ask the gardeners at your local nursery for their best advice and I bet it won't). I love working in our garden together. My 4-year-old gets especially focused, and I feel weirdly zen about everything while weeding. Don't have a good space to grow where you are? Public patches are popping up all over the country. You (or a group you put together) can pay for a plot and start growing there. It can be a great way to connect with others from your community as well. Growing anything with kids is pretty cool, and I really marvel at how much pride they have in what they grow. Plus, they will eat anything they grow; my kids sit in the backyard and nibble on green onion and carrots like a couple of bunnies. A smaller version of this is going to a farm of u-pick patch near you and picking berries. This makes for a super fun summer day, and it still starts to build the connection between the food they eat and the natural world around them. Bonus- fresh berries are so ridiculously delicious (and you can make popsicles together). If you want something faster. Figure out which wildflowers are local to your area and go plant them in fields. You could even try seed bombs! Just remember to keep visiting that spot to see how your flowers are doing! Our planet is in desperate need of trees, so maybe volunteering to plant some could be a meaningful shared time together and a help fight Climate Change. If you have an older child, check out Plant for the Planet. If not, many areas have greening efforts you could join (or start your own). Often we feel like we need structured plans for our kids to get something out of time, but really just being outside offers millions of learning opportunities, plenty of which we won't even notice as they are happening. If you do want to have some activities in your back pocket, here are some ideas. Just play. If you see that inspecting or testing, just ask them what they are up to! If you find something you think is cool, say so! It should be a no brainer, but how often do you actually just stop and play? It doesn't have to be a deep conversation, just setting the habit of verbalizing what you see. Bring a magnifying glass with you, and when you see something interesting (or there is a lull in the play) whip it out so you can look a little closer! My kids love this tool so much that I just left it in the stroller for our walks. Never fails to get another half hour of outside time when they are antsy for screen time. Does all of this seem like a lot for you to pull off yourself? 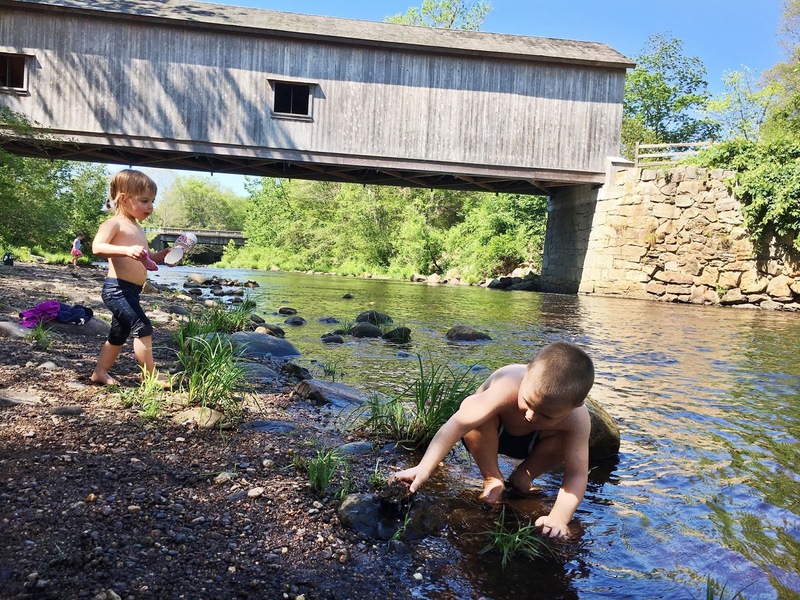 Lucky for all of us, more and more outdoor preschools and classes are opening all over the place (including national Hike it Baby, but you should check what is near you). It makes sense, since outdoor learning gets so much praise for early education. If you can't afford it, Free Forest Schools and Hike it Baby chapters are opening all over the country. They are completely run by volunteers, so if there isn't one near you, start one! I teach a kids art class about nature, and all of my students live in the city of Seattle. I know it can be hard to connect with nature in urban spaces. Who can help? Faith Ringgold. Her book Tar Beach is the perfect place to start talking about how to connect with nature even when you are surrounded by city. Learn to spot the "sneaky" nature in your life- the food you eat, your own body, plants coming out of the sidewalk, and more. So simple. Have a treat night of staying up late, lay out a blanket, and look at the stars together. If you live in too bright an area, drive out until you can get a good look. Your kids will remember that night. Did it just rain? Throw on some shoes and splash around. It's more fun if you do it too. Ice is an endless creative resource for learning. You can melt it, roll it, chip away at it. You can paint it, salt it, carve it, or smash it. It can be ice you froze especially for the occasion, or you can play with the ice nature has given you. I like this collection of ice experiment videos from Fantastic Fun and Learning. When your kid asks you a question, it can be a cool opportunity to show instead of tell. There are a million fun experiment how to's out there: we have made volcanos out of lemons, built our own lava lamps, and caught and observed fireflies. 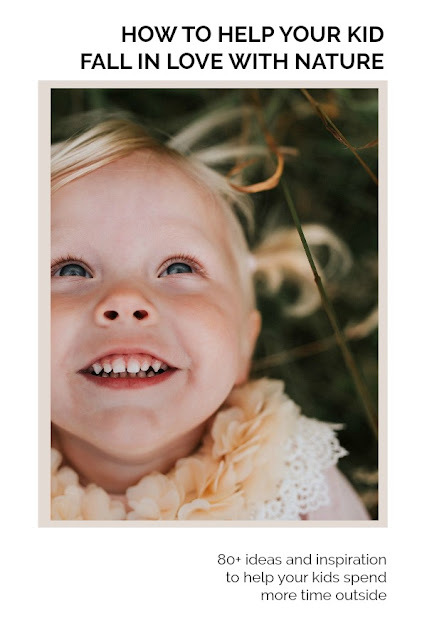 My favorite source for experiments is The Dad Lab, but obviously there are tons of resources if you just start at Pinterest. Do you have a daily walk? Or a natural area not close to your house. Visit often, and talk about what might be changing. Sometimes change is easier to see than the thing itself. In How to Raise a Wild Child, they call this a "Thinking Spot" and it looks like a brilliant option to me. Artists are collectors. Scientists are collectors. The root of most innovative and creative thinking is collecting. When your kid shows interest in a cool rock or feathers or a bunch of sticks, that is serious creative work. Let them do it, because this is just the kind of spark easily stomped out. Start taking pictures of the collections or make a space in your backyard the "museum." What grows where you are? What animals live nearby? Do the most local research you can possibly do. It's easy to get bogged down by the mundane usualness of the things we regularly see, but for our kids, it can still be new. If they ask you a question, go to your library and ask the librarian for help! 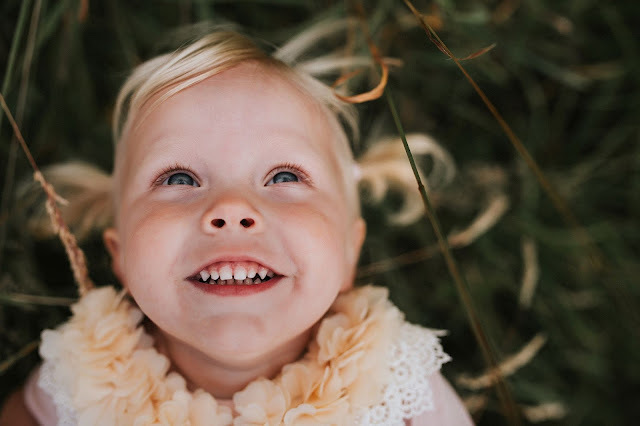 Not every type of learning can be verbalized, and if you have pre-schoolers, a sensory bin can be the best way to put tactile learning in motion. You don't need to buy anything! Take a shallower plastic tub (like the one under your bed and fill it with water, or gravel, or dirt) then throw some vehicles or animals and watch them go to town. You can make it complicated (check Pinterest) but you certainly don't have to. Kids LOVE this kind of learning. 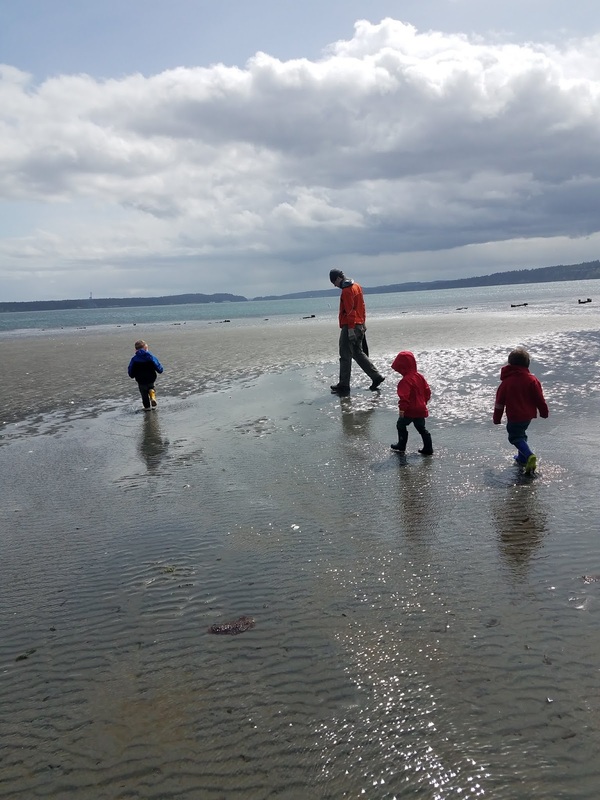 Our kids' generation rarely get the opportunity to just explore, so getting them into spaces where they can just move around can be a huge draw for some kids. Here are some ideas of how to not structure it. Really, you are doing great. You don't have to do much here. 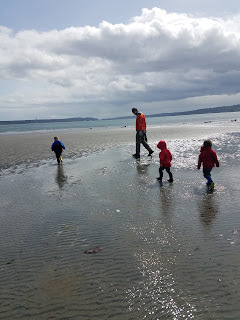 This is SOOO hard for me as a parent, but if your whole goal is "we are going to this beach and then we will be there," anything that comes out of that day is a total success! To let them explore, we have to let go of the path. It's tough, but totally worthwhile. Have a holiday coming up and you want to give an outdoorsy gift for a kid? Maybe an "Explorer Kit" would be good! Stir the Wonder has a perfect list for a DIY one. I would add 1 things- a smaller canvas bag for collecting Also, you can get a bunch of that list secondhand. And the kit will be exponentially more successful if you start out playing with them. They can be complicated races, or you can run laps down the block. Just get out and move. 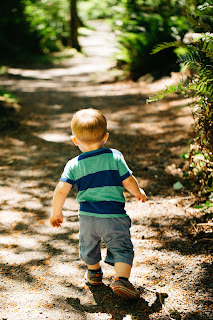 It can be easy to get in a park rut, but as Growing a Wild Child points out, our kids also need to be in spaces that are (at least partially) untouched by humans. It can be an area right around your house if you are rural, or even an urban forest if you are not. Get them out in spaces that have no particular design or purpose; it sets the stage for exploring. As parents, we spend a lot of time saying no. Janet Lansbury is an excellent parent educator (you can follow her facebook page here) and she suggests making a "yes space" which is simply a space where our kids are free to follow what they would like to do. Outdoor spaces can be perfect for this; you don't have to worry about mess in the same way. Turn your outdoor space into a space where you don't have to chase and manage. Everyone will enjoy the freedom. Red Light, Green Light. Duck Duck Goose. Freeze Tag. Hot Lava. It's all good, except Red Rover which is a fool's game. Hopefully with time, they won't need you as a participant, but depending on the demographics of the kids playing, sometimes a grown up can help. Or baseball (but it can take up their lives). Or cross country. Or Cos-Play. Or Renaissance Faires. If your kid shows interest, do it for a while and let them try it out. It could be a huge hit, and even if it isn't, you still got some good outside time out of it. We have been big on drawing maps lately, and then we use them to find "treasure" in the backyard. Super simple and beloved by our kids. If you have older kids, you could set something up for them with riddles or a photo challenge added on. This was my favorite as a kid! I loved to be outside and just play pretend. I still do it a little bit in my head. Honestly, if your kid is that kind of player, there probably isn't much you need to do to make that happen. A play kitchen inside is fun. A play kitchen with mud and rocks is even better. 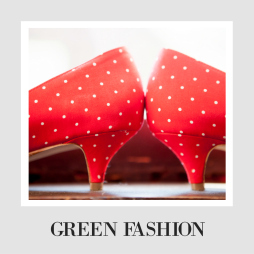 You don't have to spend an arm and a leg; see what you can find secondhand! An old tv stand or coffee table can be a kitchen with a few little adjustments. Buy some old pots and pans at Goodwill (or use what you have been meaning to donate), and just let them have at it. You don't need to buy anything to encourage imaginative play. Just use what is there. Start making a fort with branches outside, and your kids will be helping and planning in no time. If your kids are already out and playing, they may find a rock or surface that feels like a stage to them! Be ready with some music to play (on your phone) and let them have a dance party! If you have furniture or tools or yogurt containers that have reached the end of the road, do NOT throw them out. First, brainstorm with your kids if it could be a fun thing to play with outside. With their imagination, an old object can have a completely new life outside. Our old mailbox is a favorite toy now... you just never know. Before I had kids of my own, I thought it was so fun to play pretend with little kids. Now I never seem to have the patience to buy into this kind of play. It just feels like getting bossed around extra by two little beings who constantly tell me what to do already. That said, it's worth it. It can be a perfect way to really see how they are thinking AND they will love it. If you are motivated to make outside play happen, get involved! If you have space outside, make a special area for reading. If not, pack books with you when you are headed to your outdoor space. If it's warm enough, you can spend hours sitting outside, enjoying stories and imagination together. Playing is learning for kids (big and small) so encouraging that play time makes their time outside both fun and amazing for their development! 59. Play Ball. Any Kind of Ball. 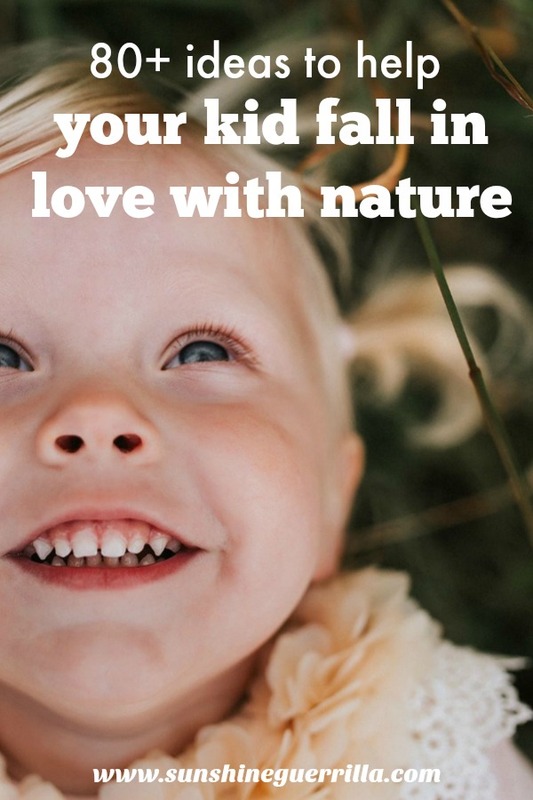 In general, I don't think you need to buy anything to set your kids up to connect with nature. But a ball can be nice It doesn't have to be fancy, just something to roll or throw (and rocks get scary for that purpose). There are a million variations, but even as an adult, I kind of think Hide and Seek is fun. It just is somehow. If you feel a lull, this classic can turn things around pretty quickly! 61. Play Pokemon Go Together! This counts as self-care and kids play all at once, right? If you or your partner like playing this outside game, go for walks with your kids and play with them. Our kids are pretty excited to help catch the Pokemon, and they are so impressed that they actually get to be on a screen that they don't notice they are on a healthy walk! If you have weather, go out and play in it! A couple of shovels and buckets can make even a seemingly miserable day into an afternoon to remember if you approach it with n attitude of fun and exploration. Water toys work for all kinds of water! Is there a simpler or more effective joy in the world than just going to a new playground? If you are at a loss, that's really all it takes. And total bonus points if you let yourself stop at a new one when you discover it. Spontaneity can become a real enemy when we are trying to keep schedules and naps in order. But it is so worth it to break that pattern every so often. I'm an art teacher, so I believe whole-heartedly in the developmental benefits of making things. Kids are so amazingly creative, and the more we can embrace that, the happier their childhoods will be. I have also seen the PURE MAGIC of kids making art outside. There are nearly endless possibilities (especially with Pinterest) but these are some of my favorite ones. This one can keep your kids busy for hours. Chalk on a sidewalk can make games, roads, or even letters. My favorite is to use it to trace shadows, so you can notice how they change in the course of the day. My 4 year old is also obsessed with the book Chalk; a fun read to add some magic to the chalk play. If you have a creek or river nearby, you can try this in action, but it doesn't have to be that literal! Get a big bucket of water, a shovel for holes, and some sticks. See what structures you can build that survive the water. Architectural concepts like load and support can be understood really early with play! My kids are really, really excited when they get to use a camera. We can take that excitement and channel it into enthusiasm for the outside! Take pictures of the animals you see together. We tracked down buds on trees and took close ups of them to compare them. Let's be honest- he did not care about the comparing, but he did love taking those pictures. Do the messiest paint project you can think of. Channel Jackson Pollock (or Lee Krasner if you are cooler), get outside, and throw, drip, and make a real mess of paint. Instead of paintbrushes, try sticks or toy cars. They turn out particularly awesome, and they set an important precedent- messiness is totally allowed outside! You can build birdhouses out of all sorts of things. Check out this post from The Art in Life and get totally inspired. I looked through and wanted to make like 3 of them. Get inspired by the Earth Art of Andy Goldworthy (look at the pieces together! Your kid can get this) and try making your own designs outside. Use things that you find outside and arrange them into art. You can start making simple shapes out of sticks or leaves, but arranging the materials can be a zen-like experience for some kids. I also have noticed doing outlines of the kids and then filling them in can be a fun project too! Collect leaves (less dry ones are better) and try making leaves with them. You can use tempera or watercolors (to pretty different effects). but just cover the leaves in colorful paint, and press them on to paper. I know this sounds too simple to be interesting, but sometimes the simplest ideas are the best ones. It doesn't really matter what you use, just being outside and making marks is pretty great. If you need a way to kill time with toddler, just give them water to paint with. It's really the action. Go for a hunt for the coolest objects you can find outside. With a little bit of clay, you can press their indentations and see all of the cool details up close. Perfect for the dinosaur-lover at your house! Lots of kids naturally are drawn to animals, and lots of adults are too. If you have an animal-lover, take full advantage of that sweet heart and curiosity! Read some books about birds (Are you my Mother?) and get a book or sheet on the birds in your area (they tend to sell them in park gift stores and outdoorsy stores). See how many you can spot together, or when you spot a bird from your house, try to identify it! If this really piques your kid's interest, you can even read up more on the bird online. It plays like a game, and you all learn a lot. Our family LOVES the Big Book of Bugs. This beautiful book has certainly taught us a lot, and our kids really like to inspect bugs when we come across them. But if you have a bug-lover, you could be more intentionally and go looking for worms or spiders or other creepy crawly outside stuff. If you are lucky enough to live somewhere with lightning bugs, catching them is always a good choice too. You may not want to use bees for honey (if you are a family of vegans for example), but you can still become beekeepers (as long as you are sure no one is allergic). If you want to learn more about taking care of our dear pollinators, I like this Stupid Easy Guide to Beekeeping as a starting place. If you can do this one, it would be extremely cool and amazing for the Earth, as we need our bee populations to thrive. If you have pets (or are planning a pet), let your kid help you take care of them! At the very least, when you take that dog for a walk, bring your kid with you. Nurturing living things teaches our children gentleness and caring, but it can also teach appreciation and observation. And in lots of cases, kids actually really like helping, especially if we set that as the norm. Call around to local farms and see if they allow visitors. Spend a day with the animals and even doing chores with them! If you are raising city kids, it can show them a totally different way of life AND it lets any kid get up close and personal with animals they may not see otherwise. Seriously, the other 99 points here matter less than just being outside (and doing it consistently). 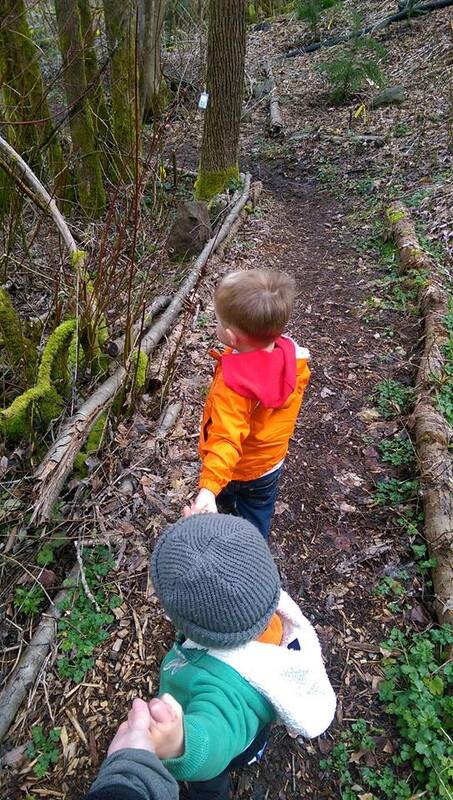 Your kids can take care of what to do, see, and learn if you just dive into nature with them. Ok, this is a long list, but I know I am missing no brainers. What has worked well for you to help your kids connect with nature? This is full of so many important reminders! I think my favorite is #4. 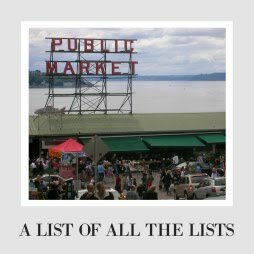 What a fantastic resource list. Fortunately at this point in time all I have to do with my boys is number 80! Will be pinning this for further inspiration at a later date. YES YES YES TO ALL OF THIS! We love hiking every weekend! What a precious picture... and some great ideas! 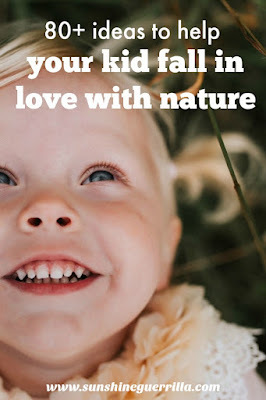 We love nature and playing outside. Especially the park, bike rides, bubbles, and scavenger hunts!